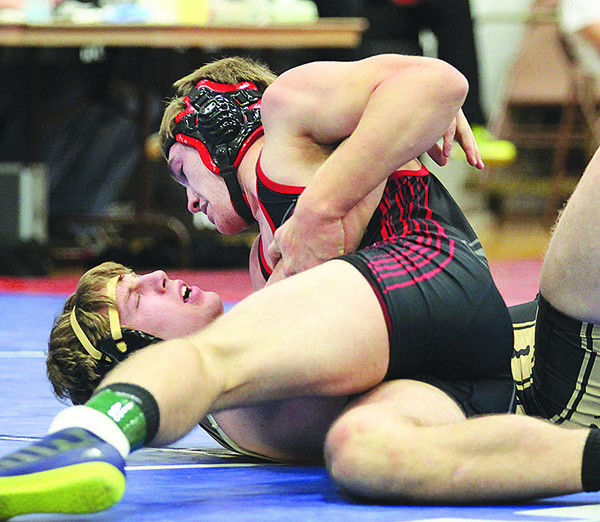 The annual Boone Central Invitational wrestling tournament again featured stout overall competition, with some outstanding individual competitors. Host Boone Central/Newman Grove had a bit of a disappointing day, according to Cardinal Coach Dale Bonge, finishing 7th in the 15-team field. Aquinas (184.5) outscored its cross town rival David City High (152.5) to win the team championship. Ten Cardinals earned places, with Will Grape, Garrett Cornwell, Trey Schafer, Bryton Fowlkes and Jesse Osantowski securing 4th place medals. “Will had a solid day, placing 4th when seeded 6th. He pinned the #3 seed and #5 seed,” Bonge commented. “Bryton, unseeded, had losses to the same guy while placing 4th. “Garrett, Trey, Jesse and Jon also placed 4th. Jesse was 3-2, placing where he was seeded. Garrett was three seconds from making the finals in a 5-4 loss. Trey had a rough day, period.